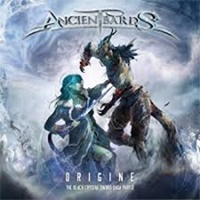 ANCIENT BARDS present what can only be described as symphonic-power-metal, soaked in mythical tales, “Origine (The Black Crystal Sword Saga Part 2)” is the lead and how to swing it when it comes to epic-assaults. Italy has once again proved how it is growing a vast-metal garden of fresh sounding band who are ripe for the picking. ANCIENT BARDS follow-up their uneven but well received “A New Dawn Ending” from 2014. What is pleasing though is how “Origine” is at times a more far-reaching affair, more balanced and a playground for vocalist Sara Squadrani to provide somersaults of apocalyptic sound. The album opens as if a monologue for an epic ‘Lord Of The Rings’’-style movie, “Origine” is the overview of the concept and gives the listener a bombastic treatment of noise before the album gets into a proper gear. “Impious Dystopia” sounds really fresh, opening with the continuation of choral meshing, the drums and remainder of the band ignite in full. What is important to note of ANCIENT BARDS is how the foundations of their sound lies deep in the original sound of eighties-metal, whereas the layers of synth-treatments and doom-filled epic noise does not detract from that. At the core they are a metal band, “Fantasy's Wings” gives a overlay of celtic-fused sound, more Scandinavian sounding than Italian, it is wholly interesting here, unexpected twists and turns come from all directions. “Light” with its reflective strings and piano is a far-cry from the opening, “Oscurità” keeps the gentle feel until a minute in when there is a transcendental-eruption from the band, and the true sound of ANCIENT BARDS is revealed. The only definite low-point is “The Hollow”, it is far too mixed an affair, they have pushed the boundaries slightly too far here, it may be hell of an effort but at times falls flat and lacks passion. On the other hand “Home Of The Rejects”-excellent title, gets the listener nicely back on track again, the drums of Federico Gatti blast this into the stratosphere and Sara Squadrani is definitely putting her talent to the test. It is refreshing to hear so much guitar-crunches and flash Hell-bent solos on an album such as this. “Origine” closes with a last intense bash with “The Great Divide”, a stunning track of depth, it takes all the positive points of the album and puts them into a mammoth song which falls slightly short of fifteen-minutes. At times there is a hypnotic-groove which in itself is entertaining, the gruff vocal treatments lend the extra drama against the angelic strains of Squadrani. ANCIENT BARDS keep this album on the right side of manic, never falling into the repetitive cheesy-affair which can so easily happen, this is a band who are capable of great things and put their very souls into this recording, in the end it remains savagely-fulfilling and a wonderful second chapter to “The Black Crystal Sword”.